Posted on Wed, Jan 13, 2010 : 7:01 p.m.
Erin Mann is baking a new cake every week for a year from the "All Cakes Considered" cookbook and shares her adventures here on Ann Arbor.com. Read past columns here. 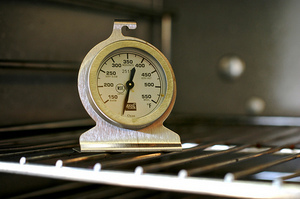 An inexpensive oven thermometer will help prevent baking blunders. I'd been having suspicions about my oven. On more than one occasion a dish went in the oven only to come out sooner than the recipe indicated. I took the first pound cake out of the oven 20 minutes early and even then the outside was a little overdone. I had to do something! I was sure my pride could not afford a year's worth of ruined cakes due to a faulty oven! Before baking the Brown Sugar Pound Cake, I purchased a Taylor oven thermometer and decided to run some tests. I positioned the thermometer so it hung on the top rack in the center of the oven (about where the cakes sit) and turned the oven on to 350 degrees. I waited a good half hour before opening the oven door to get my first read. Turns out my oven's idea of 350 degrees is more like 380 degrees. I tried other temperature settings and the results were the same; 30 degrees hotter than the dial setting. I used a butter knife to create decorative waves. I discovered many online resources about oven calibration and how to do it yourself. I didn't tinker with my oven for fear of upsetting my landlord but planned to account for the temperature difference when pre-heating to 350 degrees. I kept the thermometer inside the oven so I'd know when the oven reached the proper temperature. Unfortunately, there is no glass on my oven door so I'm unable to monitor the temperature while baking. I put the cake in the oven, crossed my fingers, and hoped for the best! I took the cake out of the oven after the recommended baking time of 70 minutes. 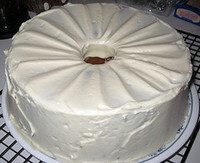 The outside of the cake was perfectly baked - golden brown and not too dry. I'd say that oven thermometer was 5 dollars well spent! Pecans are the perfect addition to this sweet cake. My favorite part of this cake is the frosting. I've tried other recipes for cream cheese frosting but none have been this good! The proportions of confectioner's sugar to cream cheese are just right; producing a frosting that's not too sweet and a good consistency for easy spreading. Erin Mann is a new contributor to AnnArbor.com. She is baking a new cake every week for a year from the "All Cakes Considered" cookbook. Email her at SheGotTheBeat@gmail.com or follow her on Twitter. 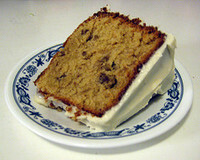 Fri, Jan 15, 2010 : 10:22 a.m.
Is the cake and frosting recipe here somewhere? Fri, Jan 15, 2010 : 9:16 a.m.
Looks like a $20 cake to me. The way you did the frosting is impressive.